If you are having a problem getting mail into Mailtraq from the Internet see this KB Article for step-by-step solutions to routing problems. In most cases there is no difficulty in connecting Outlook to Mailtraq, but sometimes you cannot get access, and this article will help you solve those problems. This KB article refers to solving problems connecting Outlook to Mailtraq, but the same principles apply to all email client connections. All editions of Mailtraq support POP3 connections from Outlook. In this article we will troubleshoot an IMAP connection, but again the same principles apply when solving POP3 connection problems. The main difference, for troubleshooting, is that IMAP connects on Port 143 and POP3 connects on Port 110. The 'Active Connections' entry in the Console shows which ports Mailtraq has available. Make sure that other programs are not already using ports that Mailtraq will need to handle your mail. If Mailtraq finds these ports in use when it starts then those sevices will be closed in Mailtraq. It is essential that Mailtraq has access to these ports to be able to offer mail services. If you do not have your LAN correctly defined Mailtraq will refuse the connection from your client. If you are trying to connect clients that are outside the LAN (for example - to a Mailtraq that is remotely hosted) please read the general FAQ page for tips on problem solving. In the Outlook Account Type dialog select IMAP (or POP3) from the drop-down list. If your configuration is correct, but you still cannot access Mailtraq from Outlook then it is most likely to be a firewall or anti-virus issue. If you cannot 'manually' connect to the Mailtraq machine on Port 143, then neither can your email clients - so you'll need to look to the way your network, firewall or routers are configured. Before starting any testing ensure that the service you are testing, in this example IMAP on Port 143 has been created and started so that it shows as 'Active = Yes' in the console. If the service starts and then stops (Active = No) that indicates the port is already in use by some other application. If you can connect, but don't get Mailtraq mentioned in the 'banner response' like the examples below, then some other program is using the port. You will either have to stop that program, change the port it is using, or change the port that Mailtraq wants to use. It essential for Mailtraq to have exclusive access to Port 143 for successful connections. Mailtraq accepts connections on the loop-back address of 127.0.0.1 by default, but you should check that you have not removed this ability. Look at Options | Server and you should see 127.0.0.1 listed in the Domain Alias ... box. If it is not there, replace it as illustrated. 2.) See if you can connect to your Mailtraq machine - which has, for example, a local IP address of 192.168.1.1 - from another machine on your LAN. You can also Telnet to other ports to check their connectivity: Port 110/POP3, Port 80/webmail, Port 25/SMTP and so on. The Event Log viewer provides a useful diagnostic tool by showing inbound connections to Mailtraq. To make it easier to see what is happening, restrict the display to just show Connections by only selecting the Connections-button in the top-row. Then perform your tests, and watch for a matching inbound IMAP connection in the log entries. If you are not familiar with Telnet then you can find information about using it here. If you need to see if your Mailtraq is accessible for SMTP access on Port 25 from the Internet you must test to your public facing IP address from a location outside your own local network (LAN). You can do this from a neighbor or from your home Internet connection. 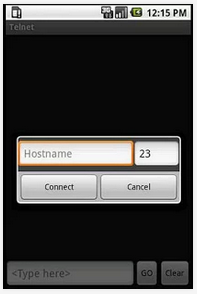 Simply enter the public facing IP address from your installation in the box named 'Hostname' in the example. Change the Port from 23 to 25. You must test your connectivity using using YOUR Public facing IP address.